... and outbuildings as a holiday home - a dream. It's maybe in this unique location, which seems hidden in the middle of a peaceful and quiet forest, you will spend your most amazing horse riding holidays. 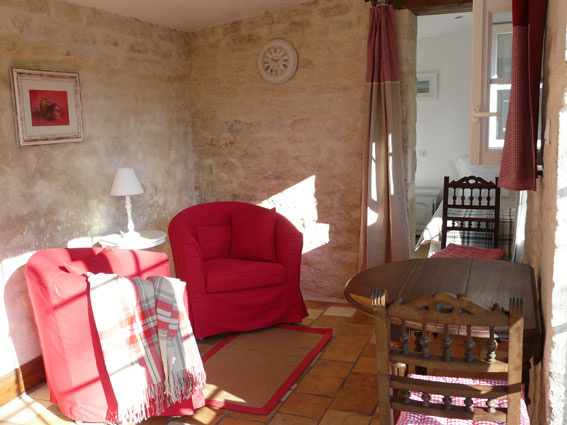 Le pouét, charming cottage for two people. If you wish to spend a romantic break, just the two of you or with a friend or even squeezing in a child, le pouét has been designed for you. This completely renovated little house, is made up of two rooms. A bedroom with two single beds (they can be put together), a living room with a fully equipped open kitchen, and a shower room. In keeping with its character it has exposed stone walls and floor and antique furniture. A cosy, rustic love-nest, it takes us back to our childhood days. Open the red curtains to watch the birds land on your window sill, totally unfazed by your presence. Situated in the courtyard by the old well, it has a private garden which is equiped with garden furniture, where you can take time out to eat and get comfortable for some rest and relaxation. Le coudrier, charming cottage for four people. Be it with family or friends - welcome to le coudrier. For up to four guests, on the ground floor there is a lounge area, a dining room, an equipped kitchen, and a large bathroom this leads up to the first floor where you will find two spacious bedrooms with single beds. Exposed stone walls and beams, antique furniture - it's in this welcoming property that you will remember those special times spent with friends and family. In winter a magnificent wood burner invites conversations around the fire. In summer the garden is relaxing and inviting under the hazelnut tree or eating together in complete tranquility. A family holiday home - memories that flood back, moments of enjoyment when on holiday, laughing and sharing, making souvenirs for the future. We do what we can to make your horse riding holiday one to remember. Our properties are prepared as if we are receiving family or friends for their holidays. We want our guests to feel good from the moment they arrive. The greatest compliment you can pay is not just to stay with us but to come back again. So remember these names, le pouét, le coudrier, they could easily be your next holiday home.